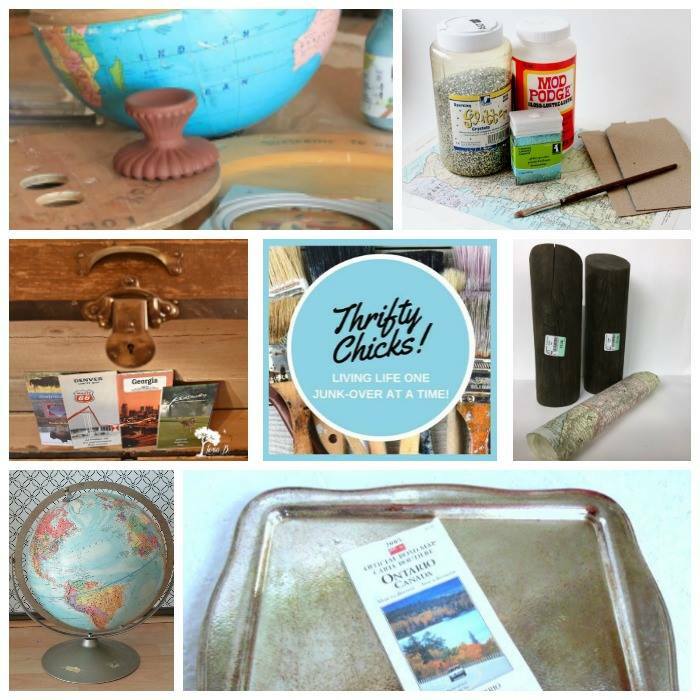 It’s Thrifty Chicks time again. Yay! I always look forward to these challenges because they really make me think about what I’m going to do. This month’s challenge was to use maps or globes in a project. I’m so excited to see what my blogging friends have come up with for this month’s map/globe challenge. There are links to all their fabulous projects at the end of this post so be sure to check them out. 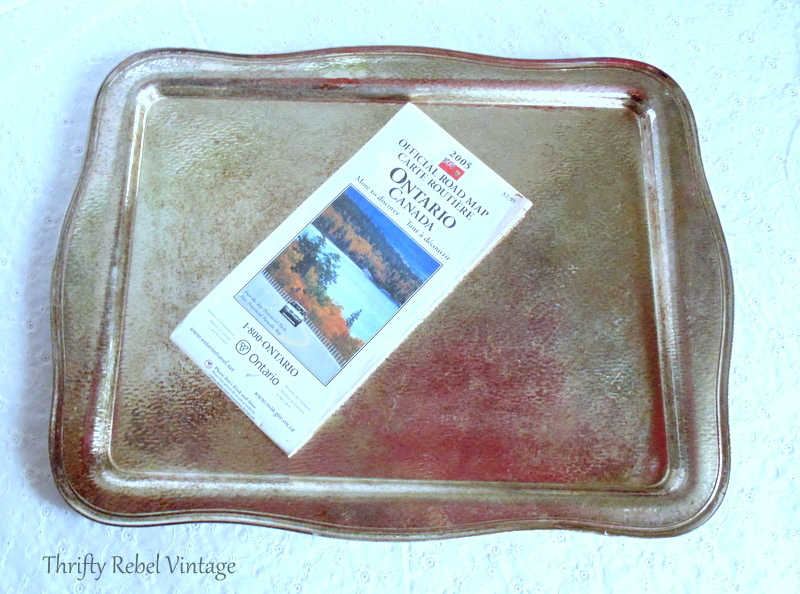 For my project I’m using a 2005 road map of my neck of the woods in Ontario, Canada and this very heavy silver plate tray. I found the tray with a $10 4 piece tea set, which is now displayed in my hot pink china cabinet. The tray didn’t match the set so it’s been waiting for its project day to come, and it’s finally here. I’ve included affiliate links for products in this post. If you purchase products by clicking on one of the links I’ll receive a small commission of any sales, but it doesn’t cost you a penny more. 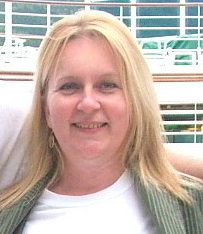 This affiliate money helps to keep TRV going, and I thank you so much for your support. Read full disclosure here. What you’ll need for this project. I say some because I added something that I wasn’t planning on. This always seems to happen to me! I wonder why. lol. You’ll see what I mean in a minute. After cutting out the area that I wanted to use a little larger than I needed, I placed my map section inside the tray and ran my pencil along the inside to gently mark the map. 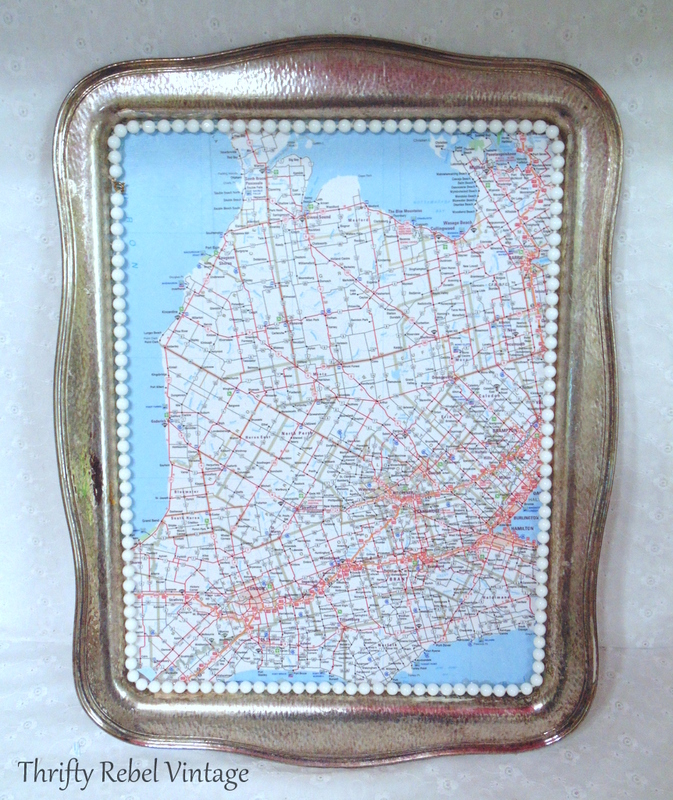 After cutting out my map along the pencil lines I applied some Mod Podge to the flat area of the tray. Then I applied my map and smoothed it out using a sandwich bag. I have quite the collection of different sized sandwich bags that I get when I buy thrift store stuff. Here it is drying waiting for its first top coat. I waited until the paper was dry and gave it 4 top coats, letting it dry in between. 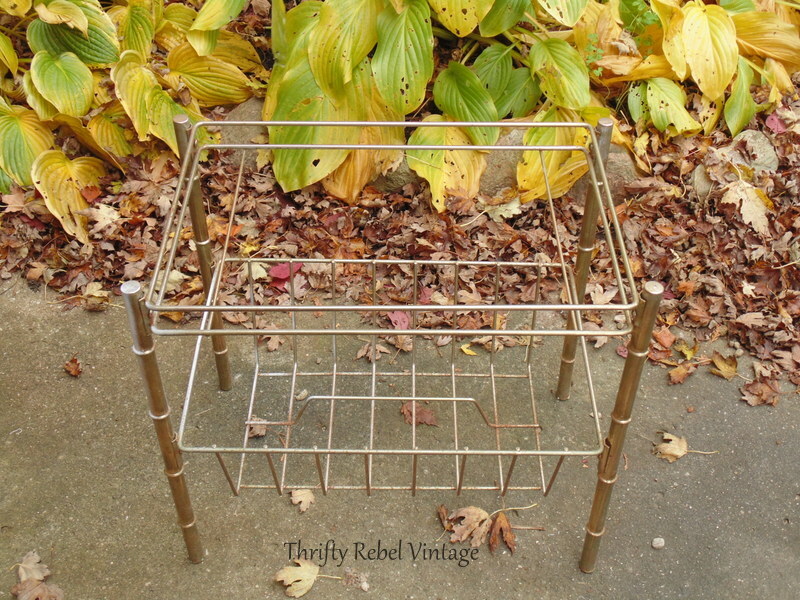 Then it was time to give this vintage gold metal magazine table some white spray paint love. It was a roadside freebie from a couple of years ago. Don’t you just love those? Originally this table would have had a glass insert, but lucky for me the top was a pretty good size for my silver tray. It was a rather cold and windy day, so I quickly painted in front of our portable firewood garage to stay out of the wind. I gave the table two light coats of a paint and primer combo and that was plenty. 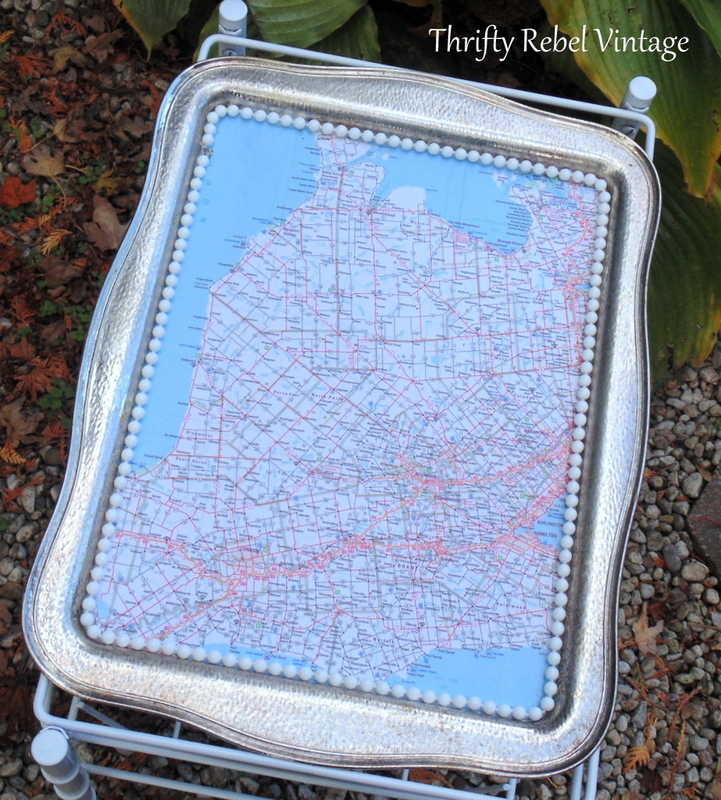 When I saw how pretty my white table turned out I thought I had to do something extra to tie in my silver tray map top a little more. 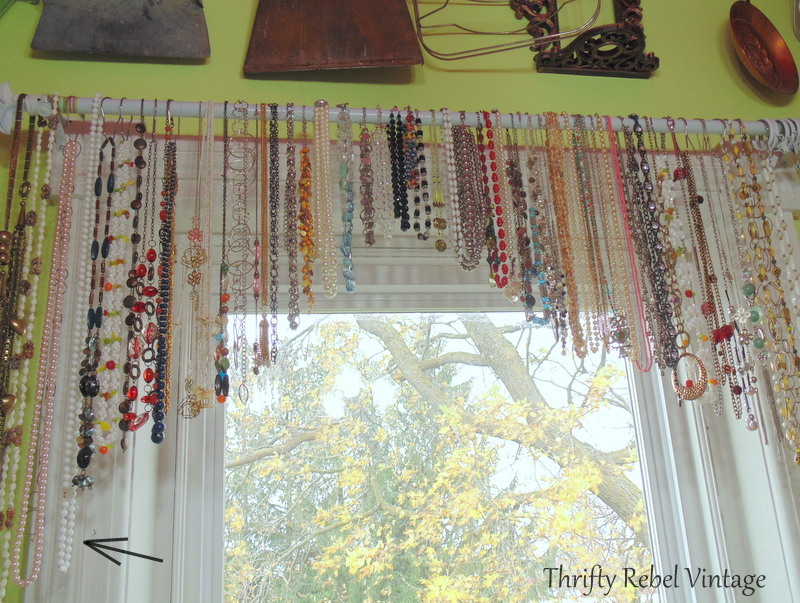 I can usually count on my necklace window valance to have something I can use, and when I saw a faux white pearl glass beaded necklace hanging there I knew that was it. It looked just right to do the trick! Using my glue gun I glued my necklace on a little at a time so the glue wouldn’t dry up on me. 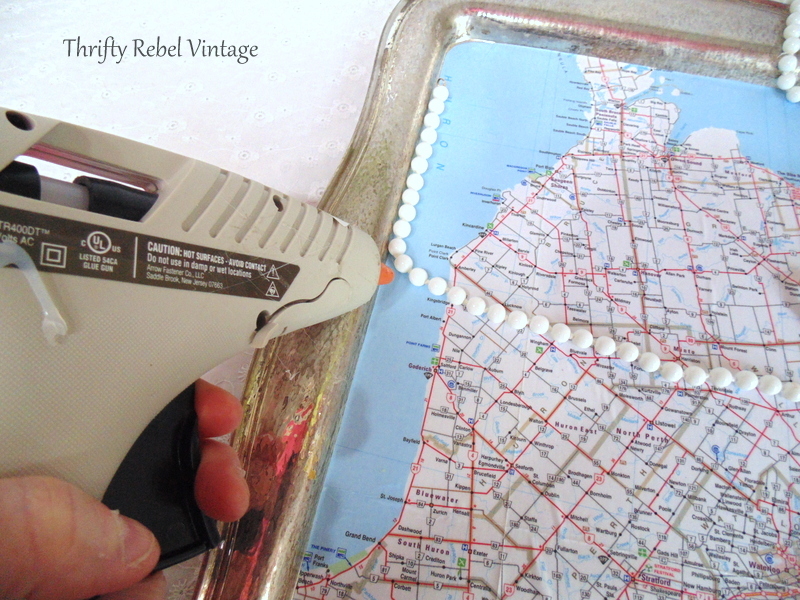 It does dry pretty darn quick, so you have to move those beads along pretty fast. I kept making my way around. … until I was done, and happy accident… the necklace was the perfect length. I left the clasp showing in the upper left because… well… why not? I think it’s fun, and it reminds me that it once upon a time was a necklace. 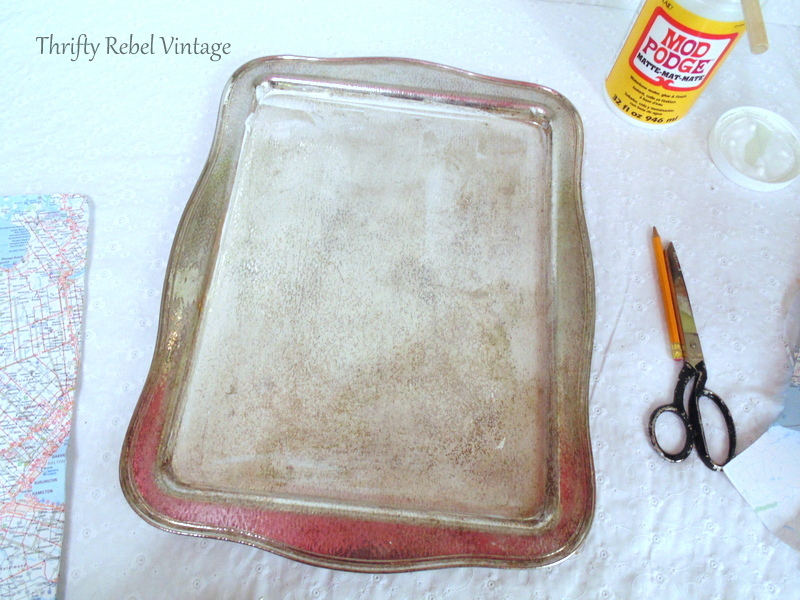 The tray sits quite snugly on the top of the table. 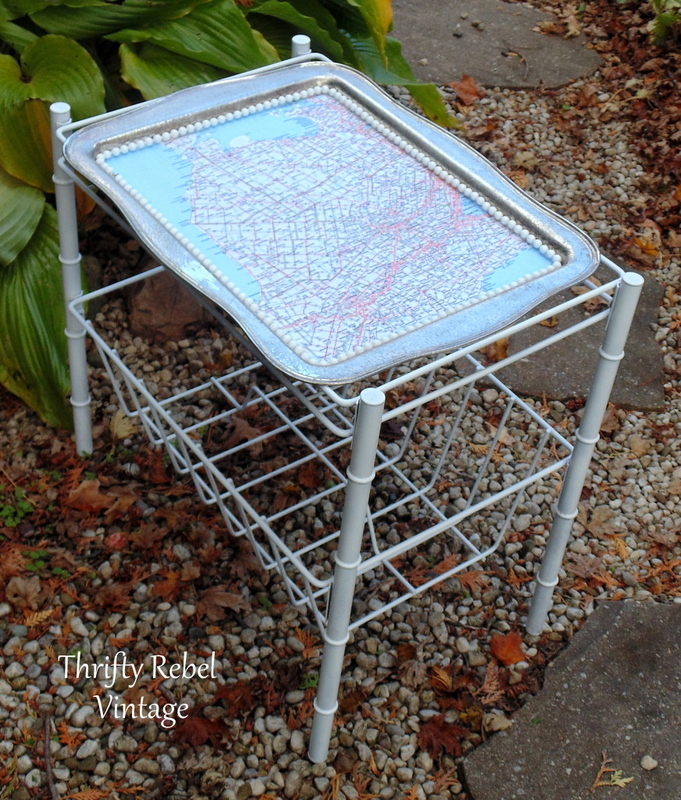 I took my map table outside to take some pics because the light in the house this time of year is not that great. Welcome to my neck of the woods in Southern Ontario, Canada. 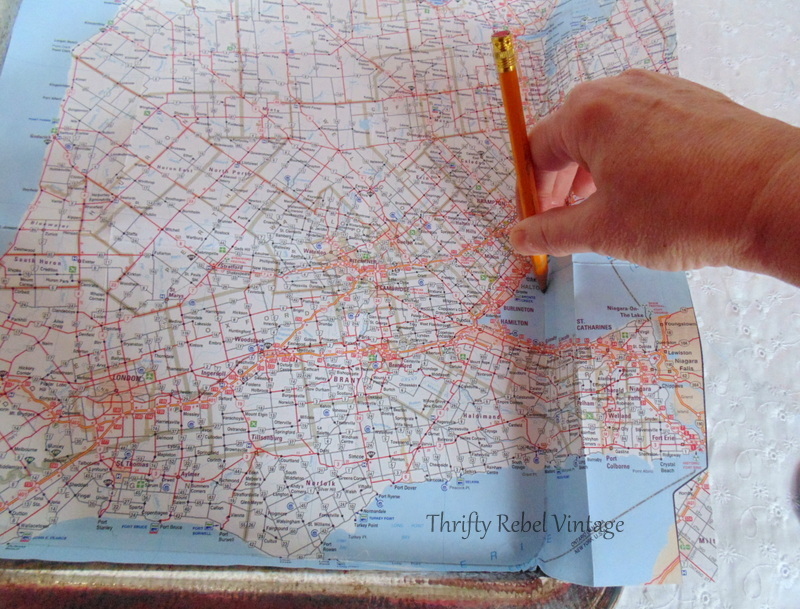 John and I have travelled many of those roads over the years, and then some. Doesn’t she have pretty legs? They kind of have a bamboo look to them that you really didn’t notice when it was that gold colour. And here’s my map table in my living room. That lamp and shade are both on my makeover list for sometime this winter. I’m not a gold girl, but for $2 it’ll do just fine for now. 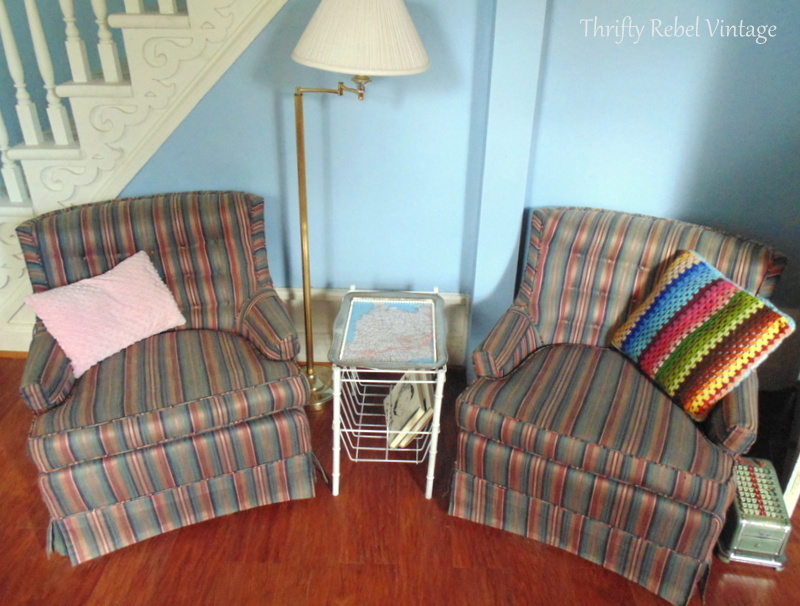 We found the pair of vintage 80’s swivel rockers for just $50. 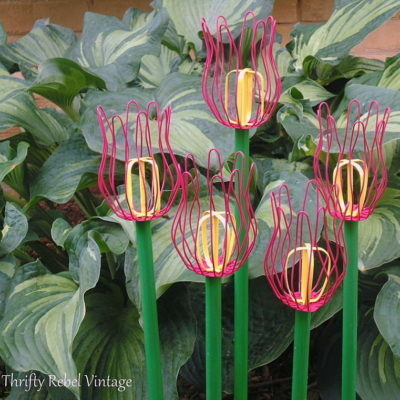 The original owner was downsizing, and they were in fabulous almost like new condition. 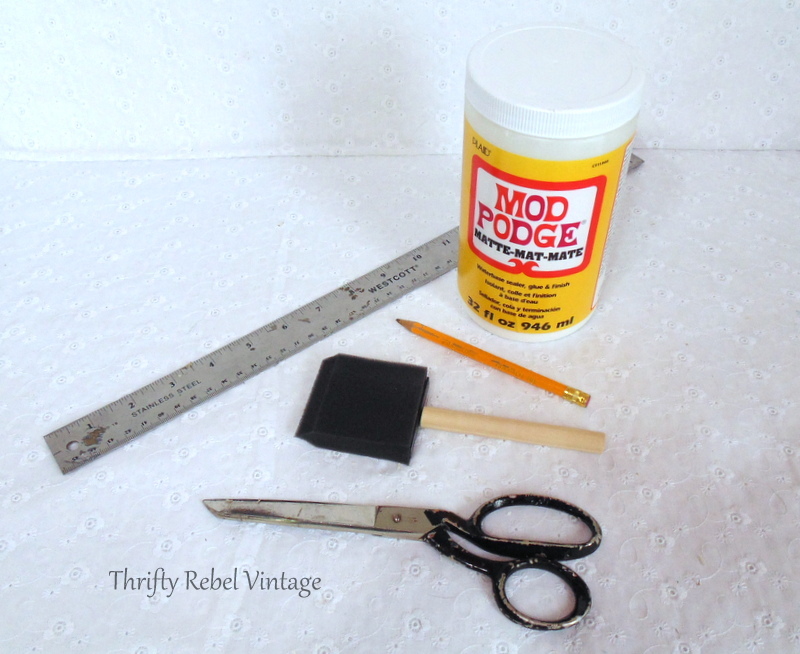 The vintage adding machine beside the chair on the right is my version of a door stop. It’s super heavy and stops the kitchen door from hitting the chair. John and I do a lot of reading in the winter and my decoupaged map table completes this living room area nicely. There’s a wood stove directly across from these chairs and it’s a very cozy spot when it’s freezing outside. I’m almost looking forward to winter this year. Almost. lol. Now be sure to check out what my friends did with their map/globe projects. I’m sharing this project at these fabulous parties here. This is an awesome idea using a map of your area, Tuula! And it turned out so lovely! 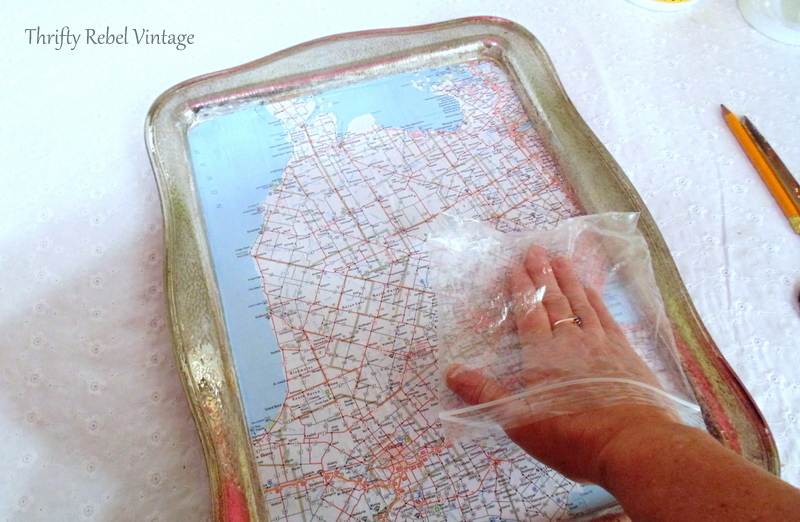 I usually use plastic cling wrap to smooth decoupage but I like your way of using a sandwich bag better. That’s so much easier to use! Can’t believe that necklace was the perfect length; that never happens to me! Cute project! Nothing better than a roadside find to refresh! Pinned! Thanks Lora! 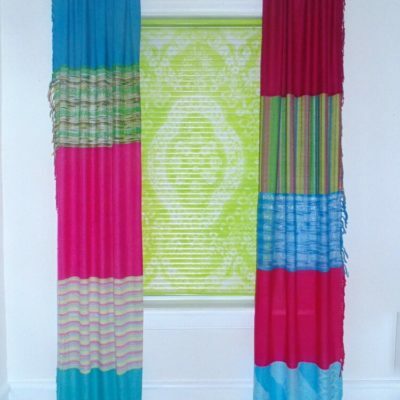 The necklace was a stroke of luck, but I do have quite the window valance collection for times like this. Love roadside freebies! Your table turned out great tuula! And I can’t believe you found those rockers for such a great deal! Thanks Tania! I can’t believe that I’m old enough that the 80s are now vintage. lol. I’m right there with ya!! This is so great. I love how you finished it off with the necklace and it was the perfect fit. It is a happy marriage of two pieces, they were made for each other. Thanks Debra! It does help to have stashes to pull things from. Not sure what I’d do without all my goodies. LOVE the idea of decoupaging maps. 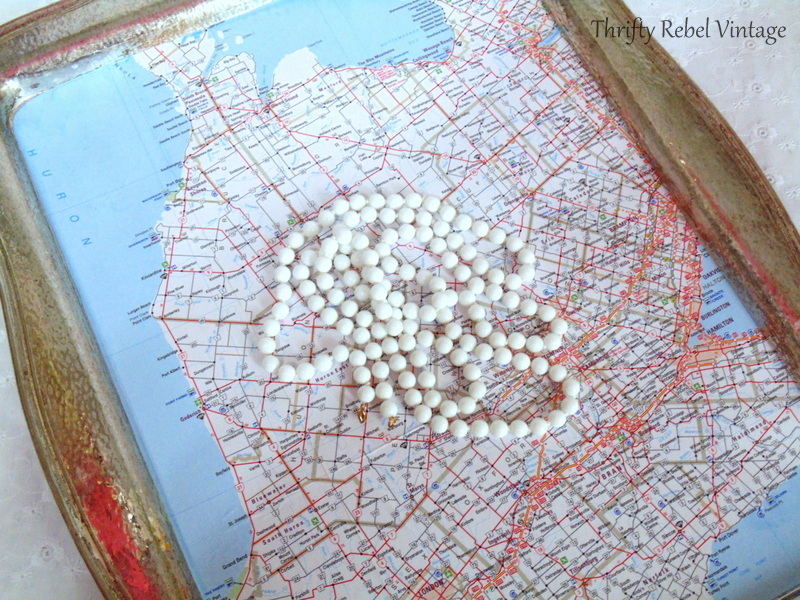 Thinking about using maps of places I’ve been, using wood & making a wall grouping…..THANKS FOR THE IDEA. Now, to find the time to get it DONE!!! Thanks Deb! To be honest when I fell in love with the adding machine I couldn’t think of anything else to use it for. I’ve seen the keys used in projects, but I just couldn’t take it apart. If it was damaged in some way I might have done that, but it’s in such good condition. It’s so darn heavy, it makes a perfect door stop. Thanks Florence! We do seem to have similar tastes. I’m glad I’m not the only crazy one. lol. With our winters here we really need as many cozy spots as possible. How does the tray hold up with soda, wine or water marks? Such a great project, Tuula 🙂 Love the addition of the beads, and it’s so “you” to boot! Thanks so much Diana! It was a fun challenge, and a pretty easy project. Don’t you love it when a project comes together just perfectly! Great project. I love it when a project doesn’t involve $30 worth of “ingridients” to finish, too. Thanks Kathy! 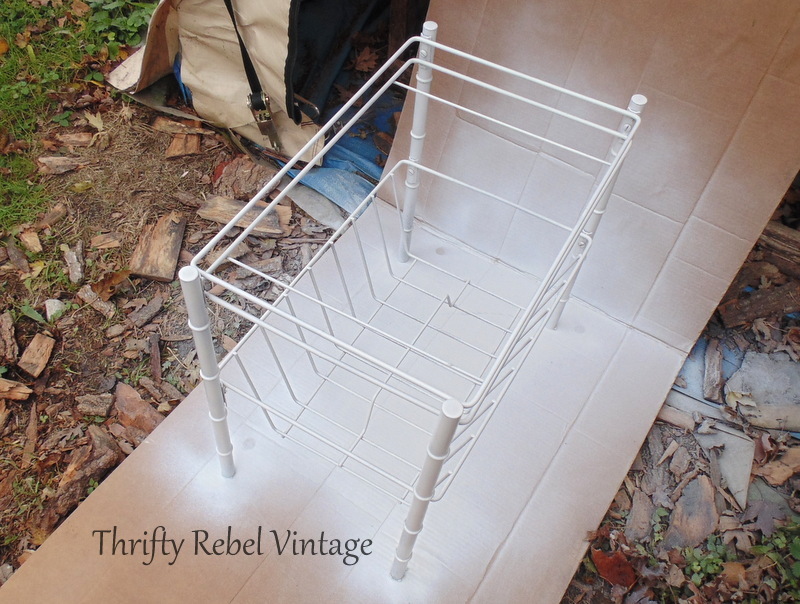 I’m always trying to do projects that are inexpensive that’s for sure. I love giving roadside finds a new life. 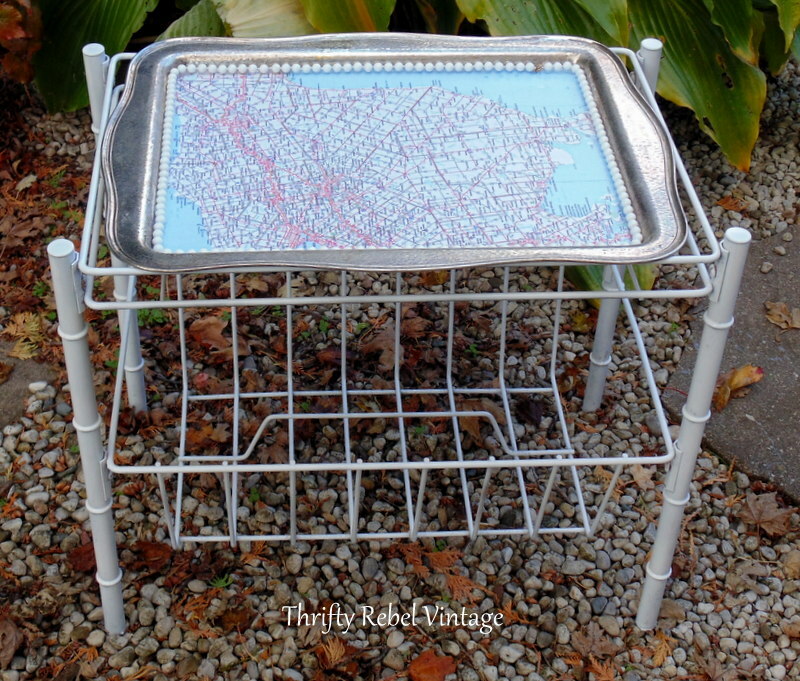 Love how you repurposed so many items to make this awesome map table, Tuula! 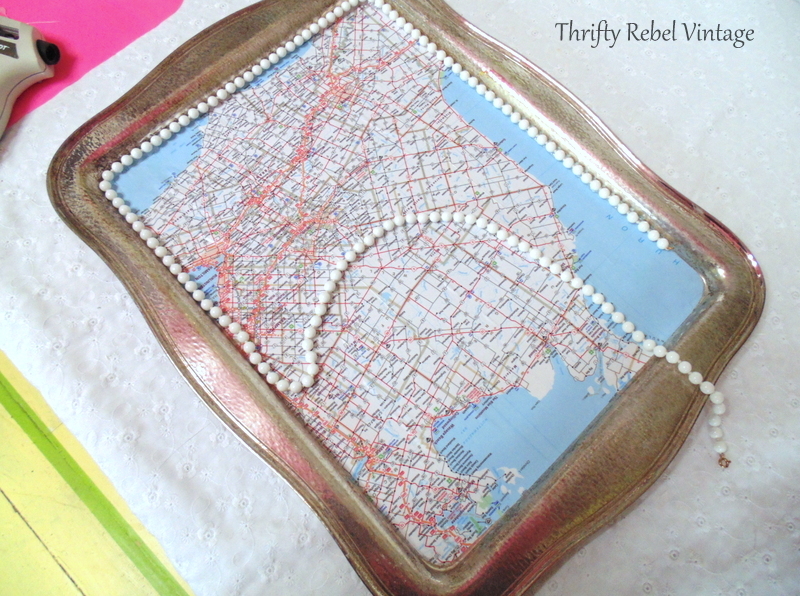 The pearl necklace trim is so pretty and I like how you can use the tray separately from the table if needed. 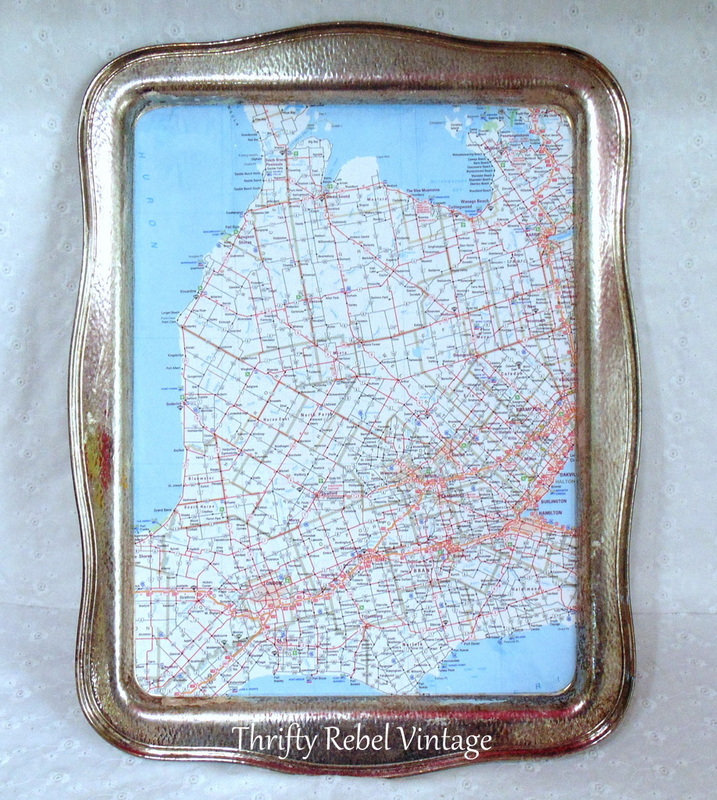 From one Canuck to another, personalizing it with a map of Southern Ontario is a great touch. Thanks very much Marie! Since I love decoupaging, this was a fun challenge.